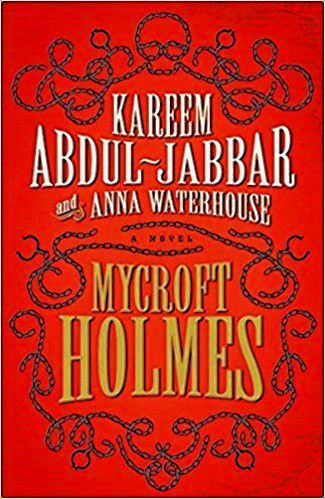 This is an exciting adventure story about Mycroft Holmes, Sherlock Holmes’s big brother. Mycroft is a 23-year-old English gentleman who has just finished at Cambridge, and has a responsible job working for the Secretary of State for War. He asks beautiful Georgiana Sutton for her hand in marriage, and she accepts. But Georgiana has a terrible secret that began in her childhood in Trinidad. Mycroft’s best friend is Douglas, a free black man who owns a tobacco shop. Douglas was also brought up in Trinidad and now they hear of terrible things happening there – children are being killed by malevolent creatures, creatures that walk with their feet turned backwards. Georgiana finds out about the children and says that she must return to Trinidad at once – and alone. Mycroft and Douglas decide to follow her. They are attacked while on board. Someone wants to warn them off. They go through many hardships to find out the truth. And the truths that they uncover are more horrible than they could have imagined. This is a thrilling mystery with many twists and turns, unusual characters, brave warriors and an evil villain. Mycroft uses his powers of observation and brilliant intellect to solve problems and overcome their enemies. Sherlock also makes a few appearances in this tale. This story shows us Mycroft in his youth; it gives the background for the man who becomes a great secret influence in the British government in the Sherlock Holmes stories. But in this story, he is a man of action, and a partner with his good friend Douglas, both of them remarkable characters. If you like Sherlock Holmes adventures, give this a try!